Review posted July 21, 2018. Adventure Publications, Cambridge, Minnesota, 2017. 32 pages. 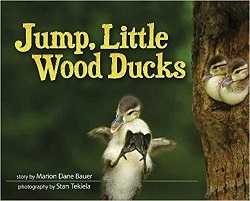 Here’s a photo illustrated picture book that should work well in story time – with facts about wood ducks in the back. Within 24 to 48 hours of hatching, the ducklings are eager to jump out of the nest and get started in life. Before leaving the nest, the mother allows her ducklings to climb and jump all over her. Mama sits patiently while the youngsters jump around like popcorn popping. She doesn’t help the babies jump – they do it all on their own. When the mother decides it’s time to leave, she flies to the ground and calls softly to the ducklings. Each duckling climbs swiftly to the cavity entrance and launches into the air. They jump one at a time or go out 2 or 3 together. The entire process of leaving the nest takes under 2 minutes. All ducklings need to exit quickly so that the whole group can stay together with their mother. But the main text of the book imagines that the last 3 ducklings are reluctant to jump. It’s awfully high. They’d rather stay comfortable in their nest. There’s a nice refrain with the last duckling just whispering “Uh-uh.” The language is simple and makes a suspenseful story. I wouldn't want to jump, either! The gorgeous photo illustrations are what makes this book wonderful. The author weaves in facts about wood ducks as the mother duck tries to entice her children out – like the yummy things they’d eat (water bugs) and the habitat they’d jump into. The pictures have plenty of variety, but above all show the adorable ducklings. Stan Tekiela must be an incredibly patient photographer to have captured these so perfectly.